Buffalo Spirit seems to be a Native American inspired slot machine, though it’s more about the spirits of the animals of the prairie, and less about the people. The Buffalo is indeed present on the reels, along with foxes, owls or eagles, among other things. The features are the ones that should get most of the attention in this case, the design having a few too many card symbols included. It’s a game which comes from WMS. On the 5 reels of Buffalo Spirit you will discover up to 30 bet lines. There are free spins, multipliers, scatters and wilds inside, plus a $1,500 jackpot. There are two types of wilds in the game, one of them the kind that transforms other symbols. 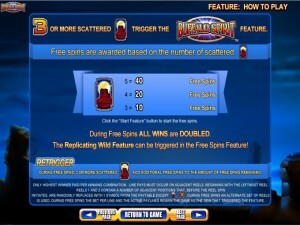 The third special symbol is the scatter, with its free spins and multipliers. The two Buffalo symbols are both wilds, but they appear on different reels. You have the transforming wild on the 3rd reel, while the regular wild is present on the reels 1, 2, 4 and 5. You can replace a regular wild with a transforming wild, so a combo of up to five such symbols can form, and paying up to 500x the line bet when this happens. However, regular wilds can’t substitute for transforming wilds. The regular wild substitutes for the other symbols, like you would expect it to. The transforming wild does that, but it also turns a random number of symbols around it into other icons. 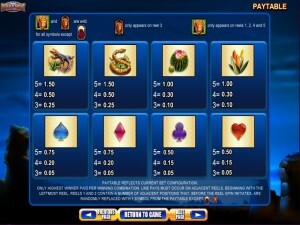 It will give you an additional chance to form combinations that round when it makes an appearance. The number of symbols which are turned is random. The picture with the Full Moon showing from behind a rock is the scatter icon of the slot. 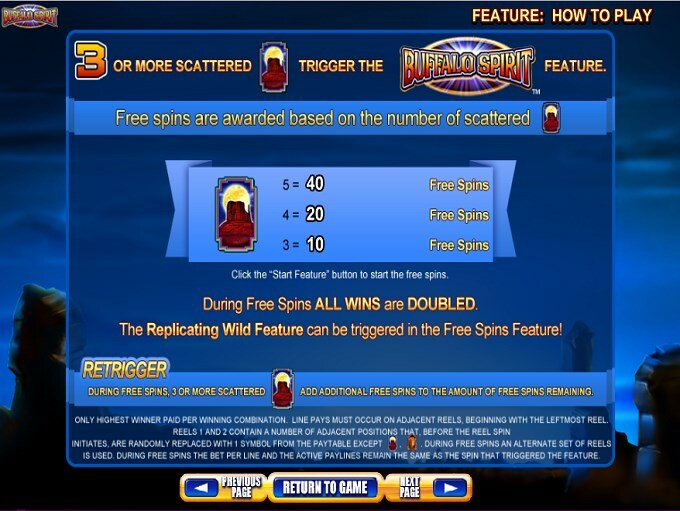 At least three Full Moon scatters need to appear during a spin, in order for you to get the free spins. 10, 20 or 40 spins are given for 3, 4 or 5 Full Moon symbols, respectively. You can retrigger the free spins as you play through the initial batch, plus you will win bigger prizes, since a 2x multiplier is applied to the wins. The maximum bet possible in Buffalo Spirit is worth $90, using $3 coins for the 30 lines that are available. The minimum denomination of a coin is $0.01. 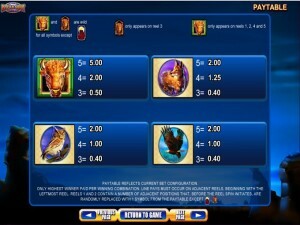 Land five Buffalo wilds on a payline, and your reward will be 500 coins, which only means $1,500. The game is themed around the prairie wildlife, so the vast majority of the symbols will be inspired by it and will show you animals, birds, lizards and plants that live there. There are a couple of card suites icons as well, and they tend to appear often on the reels since they’re the ones that pay the least. Symbols: Buffalo (wild, 500 coins), Full Moon (scatter), Fox (200 coins), Owl (200 coins), American Eagle (200 coins), Lizard (150 coins), Snake (150 coins), Cactus Fruit (100 coins), Flowers (100 coins), Spade (75 coins), Diamond (75 coins), Clubs (50 coins) and Hearts (50 coins). 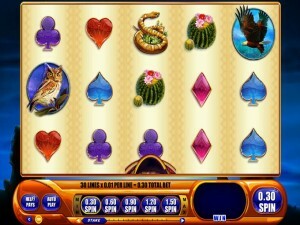 It’s one of the many similar slot machines, with wild animals at the center of the attention. It doesn’t give you good enough prizes to be worth pursuing though. 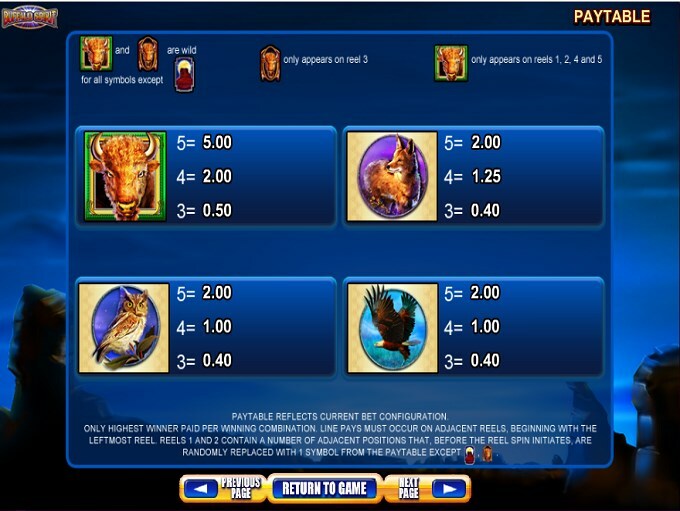 This Buffalo Spirit slot is offered by all online casinos with WMS software, playable either in practice or in real money mode.